Time for another Speed Review, where I review a set after building it on a livestream! 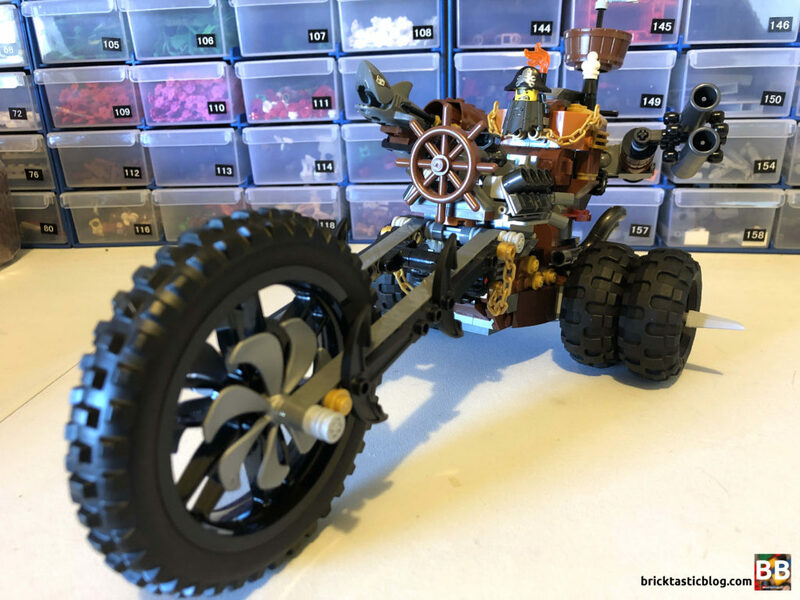 A week or so ago, I got stuck into 70834 MetalBeard’s Heavy Metal Motor Trike! It’s a big, bold and crazy set, and it was a fun two hours putting it together. Inside the box were four numbered parts bags, a bag of wheels and tyres, and an instruction booklet. No stickers! 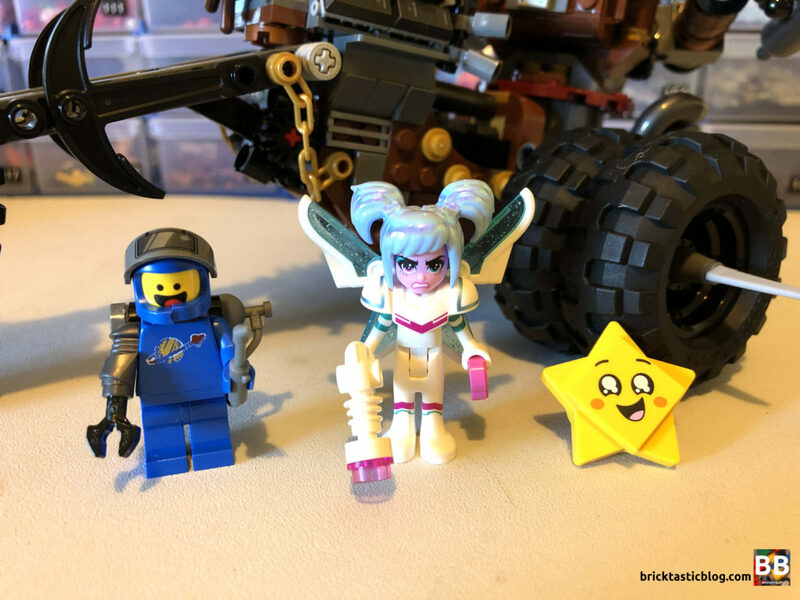 The LEGO Movie 2 Theme is exciting, as it’s the first theme to blend multiple systems – in this case, standard System and Friends. 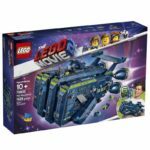 It’s a very clever approach, as the sets appeal much more than standard sets to both boys and girls. In fact, this is the first minidoll I’ve ever seen that I absolutely love, and I want more copies! 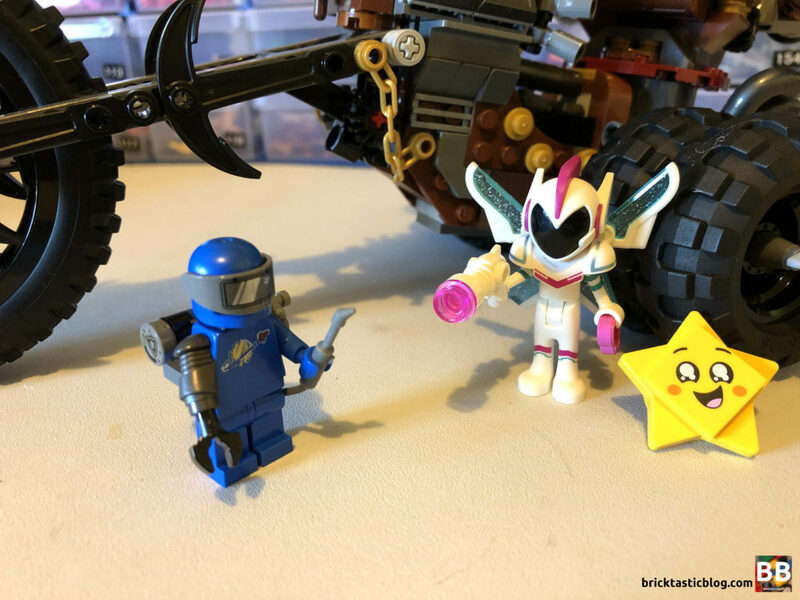 The two minifigures included are Apocalypse Benny and a very angry Sweet Mayhem. I’m not exactly sure what’s happened to Benny to give him a metal arm (ashamedly I’ve still not seen the movie), but either way, he looks excellent! I really like the welding unit attached to his back – not only that, but he can hold the torch end while it’s connected. Angry Sweet Mayhem (what a name!) is just brilliant. Her armour is beautiful, in the two colour tones, but what is the best element I’ve seen in a long time is Sweet Mayhem’s hair. It’s got a glittery effect to it, and looks absolutely phenomenal. The shaping is amazing – I’m really looking forward to seeing it in the film. 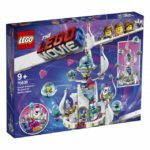 There are some awesome inclusions in this set – a shark with an eye patch, reddish brown jet engine housing, that massive motorbike tyre and rim, another heart tile, large fan blades, white laser blasters, the star element, anchors, plenty of pearl gold, and some chains in that colour, just to name a few. 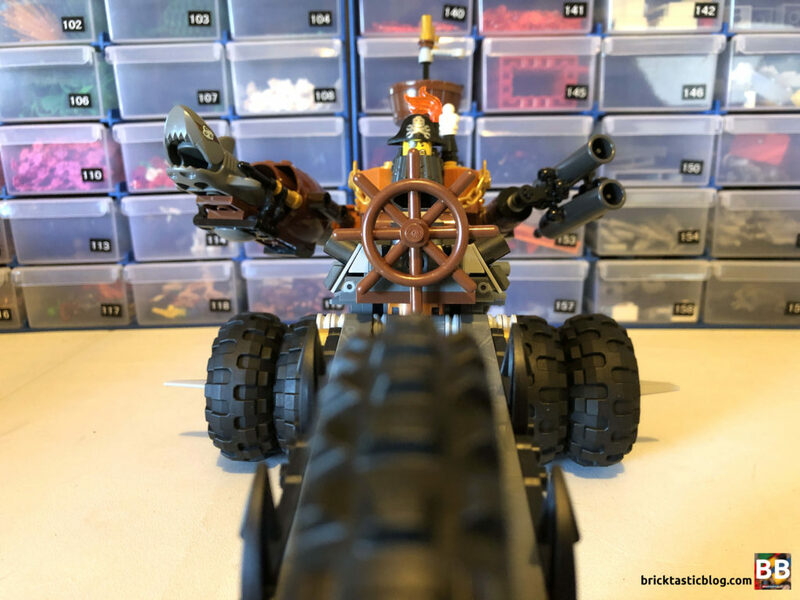 It’s a solid parts booster – just what you’d expect from a MetalBeard vehicle. This set is seriously fun to swoosh around the carpet. Popping wheelies, shooting sharks (and the regular cannons too), and generally causing mayhem (to Sweet Mayhem in particular) – it’s all a lot of fun. 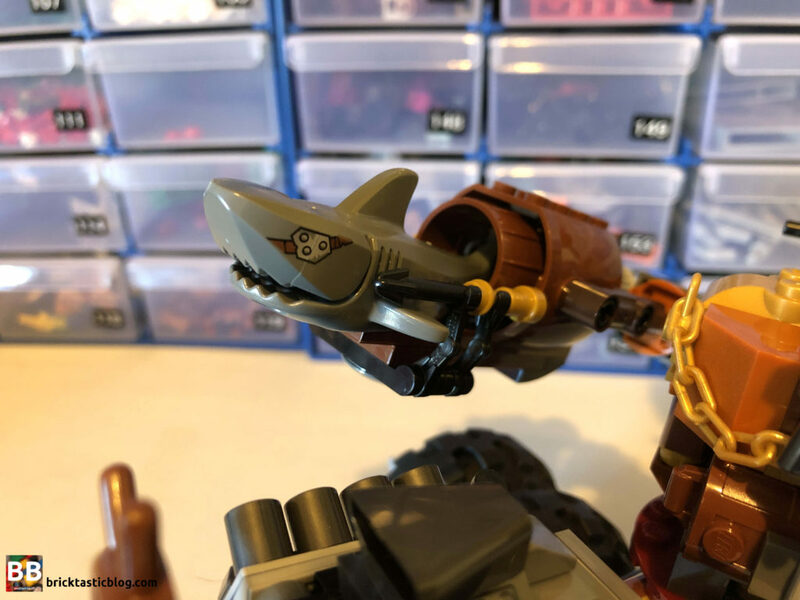 The articulated “arms” of MetalBeard’s trike are perfect, although the shark doesn’t stay in very well – there’s nothing to hold him in. 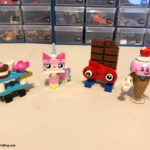 This is a fun set to play with – kids are going to love it. The build begins with the rear axle and chassis of the bike. It’s relatively quick to do (if you weren’t doing a livestream at the same time! ), and before long, you’ve added the four exhaust pipes and are starting on the engine. It’s not until you add the details of the engine that you realise you’re building the engine! Once it’s done, it’s time for MetalBeard’s body. His body section actually swivels on the bike, thanks to a turntable element. 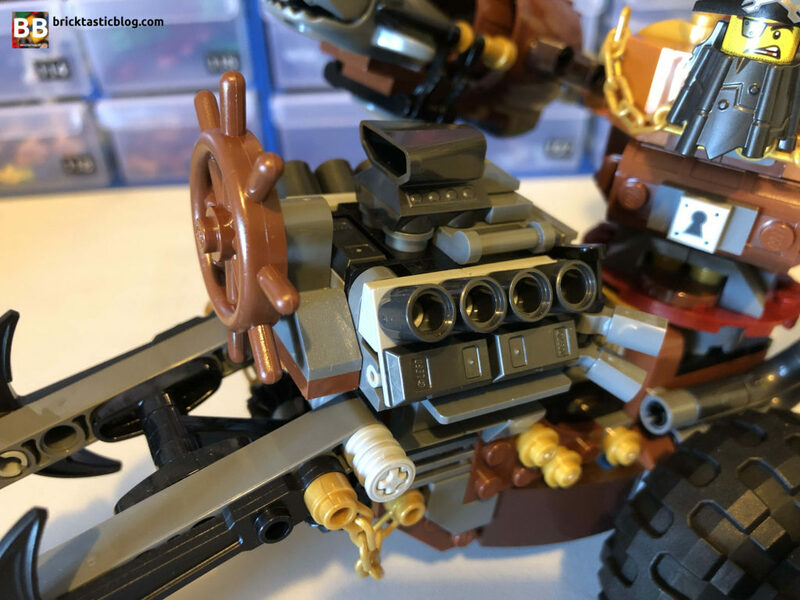 This bit is chunky and has studs at all sorts of angles, including a brilliant treasure chest with a sausage and a bone – I think this is meant to be MetalBeard’s stomach? Either way – it’s very clever! Once he’s attached, it’s time for the front fork and tyres, before moving on to the mast at the back, and the arms. To be honest, once the main body of the bike is done, it moves pretty quickly. It’s fun, and given the style of it, a fun build that’s got lots of surprises in store. There’s only a little bit of repetition in the body, but it’s minimal. Man, this thing looks cool! It’s big, mean, and is MetalBeard to the very last anchor and mast. I love this thing! 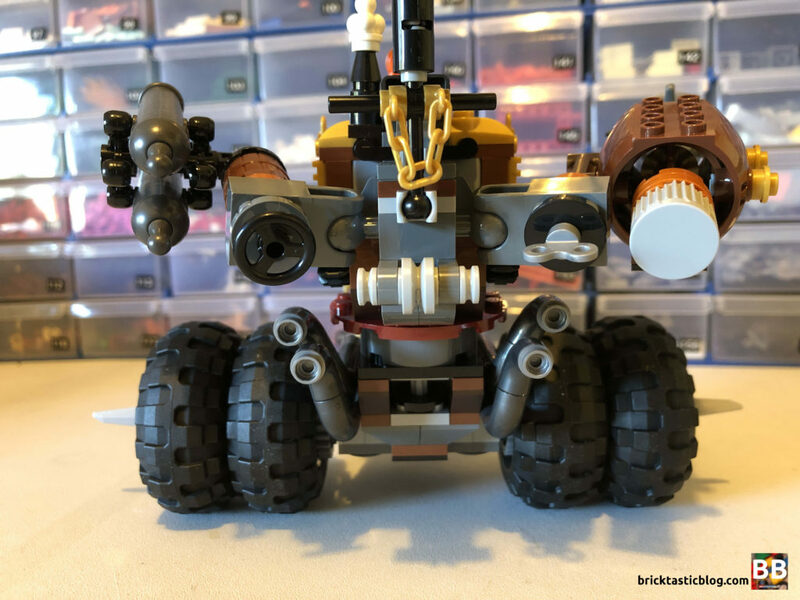 The big tyres are perfect for cruising around Apocalypseburg, and I love that MetalBeard’s teeny tiny head is so prominent at the top. Seriously, this build is spot on. I’m glad it wasn’t made smaller – the size of it just screams “play with me!”. I honestly can’t fault the look of it, (aside from the shark falling out all the time). 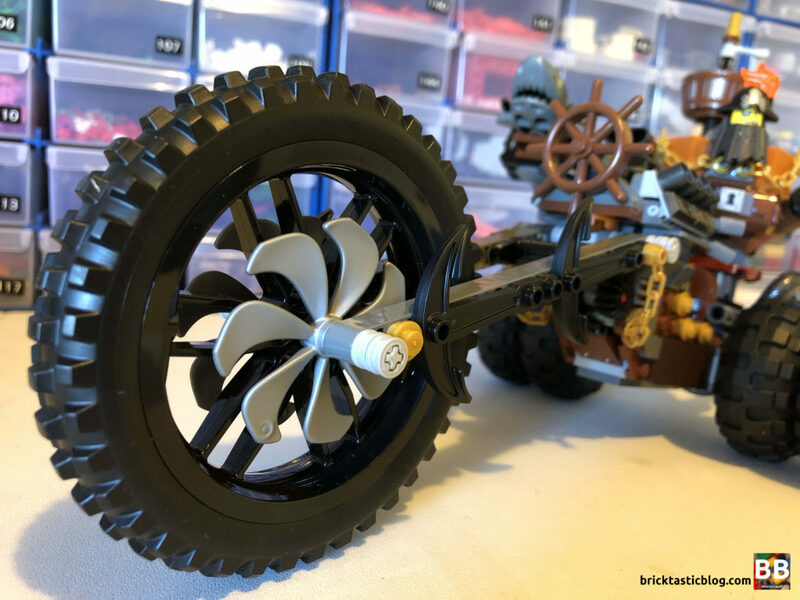 70834 MetalBeard’s Heavy Metal Motor Trike is not cheap. At AU $89.99, it’s a fair bit of coin to shell out. If I’m honest, for that amount of money, I’d want a bit more. Yes, it’s great, but it’s not cheap. At just under 20c per element, that’s a bit too much. Sure, it’s the TLM2 badge you’re paying a little more for, but I would have expected the same elements for around $70, not $90. The inclusions are great, but not $90 great. 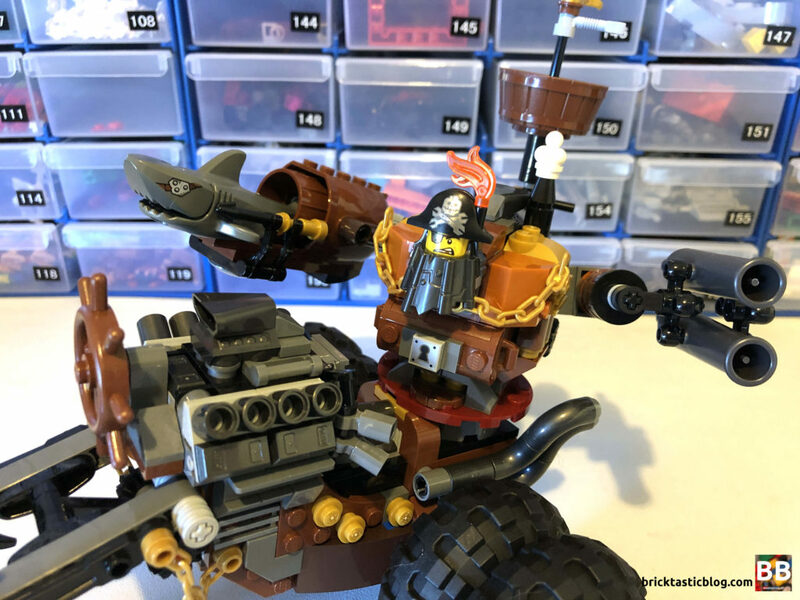 MetalBeard sets have proven to be quite popular, with the Sea Cow still high up on my LEGO bucket list. 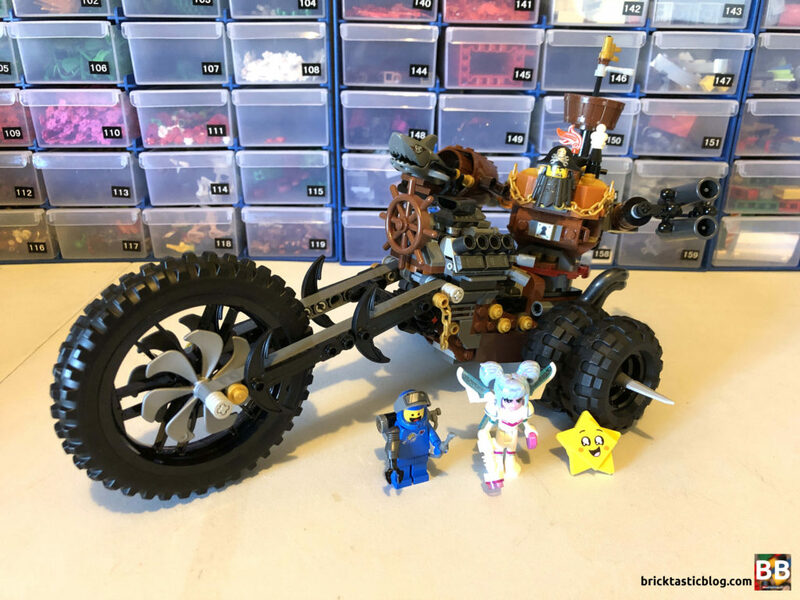 They’re wacky, with a good chunk of steampunk and craziness mixed in, and a dash of shark on top. This is one set you’ll want to have in your collection. It may go up in price when it retires, but I don’t think it will, as it’s quite high already, but it sure is a fun one.